Children learnt to ride as soon as they could walk. 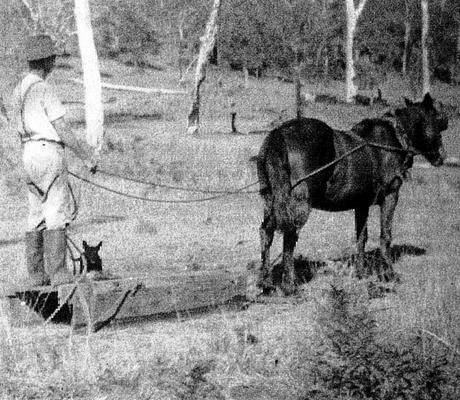 Almost all country schools had a horse paddock and one of the most popular forms of transport for the Far North Coast Dairy farmer was the horse and slide. This was used when cream needed to be moved from the dairy to the road side cream house for pick up by the local cream carrier. Previous to World War II (WWII) most dairy farmers used horse transportation to move their milk from farm to the closest creamery or river boat for the next step in the production process. Men worked using draught horses, tip dray and the good old pick and shovel method! Post WWII bulldozers, motor cars and lorries started to replace the faithful horse and bullock teams.